Remember to use caution to keep from injuring yourself. Do not breathe in solder fumes. Keep your head away from being directly above where the soldering is occurring. Also be careful not to get your fingers too close to the hot tip of the iron or to the hot wires or rails after they’ve just been soldered. •	A standard soldering iron… 25-watt is adequate for light wiring, but if you are intending on soldering wires to a 14-gauge power bus or larger, you should use a 40 or 60-watt iron. I have tried the so-called cold or cool-tip irons, but I have been disappointed by the slowness and decreased efficiency. I have been using a butane soldering iron recently, which works very well – It heats up very quickly, you can easily adjust the level of heat, and you can turn it off quickly. Whichever iron you use, remember to use the right tip - i.e., use small pencil-tips for small jobs. •	A soldering stand where you can park your soldering iron while it is hot to prevent damage to your layout surface. •	A damp sponge so you can frequently wipe off your soldering tip to keep it clean. •	Solder… Use lead-free rosin-core solder. Rosin helps the solder flow into the joint more easily. Don’t use acid-core solder, since it may cause metal corrosion and doesn’t work that well for electrical applications. 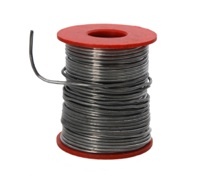 •	Flux… It transfers heat well and helps the solder flow more easily into the joint. Can be liquid or paste. Use paste if you’re working on a vertical surface. Use liquid otherwise. First, line up the rail joint carefully so that the tops and the insides of the rails are flush. If you can keep them in this position while soldering, you will have fewer derailments. Then apply liquid flux to the outside of the rail joint. Unravel several inches of the solder from the spool. 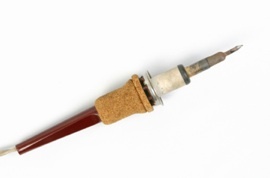 Heat up the soldering iron and “tin” it by coating the tip with solder, which will help in transferring heat to the joint more quickly. Then hold the tip to the outside of the rail joint for several seconds to allow the rail to heat up. Then touch the solder to both the rail and the tip of the soldering iron at the same time. As the solder heats up it will suddenly become liquid and flow into the joint and along the outside of the rail joint. You don’t need much of the solder to do the job. If it forms a large bead, you probably applied too much solder or didn’t heat up the rail enough before you applied the solder. That’s ok. Just re-apply the tip of the iron to the outside of the rail and to the bead of solder till it flattens out. Sometimes it helps to run the tip along the outside of the rail to flatten out the solder. Sometimes you have to use the tip of the iron to try to remove the excess solder and wipe it off on the sponge. The technique usually requires a little practice, but it’s not that difficult. After you do several of them, it gets easier. 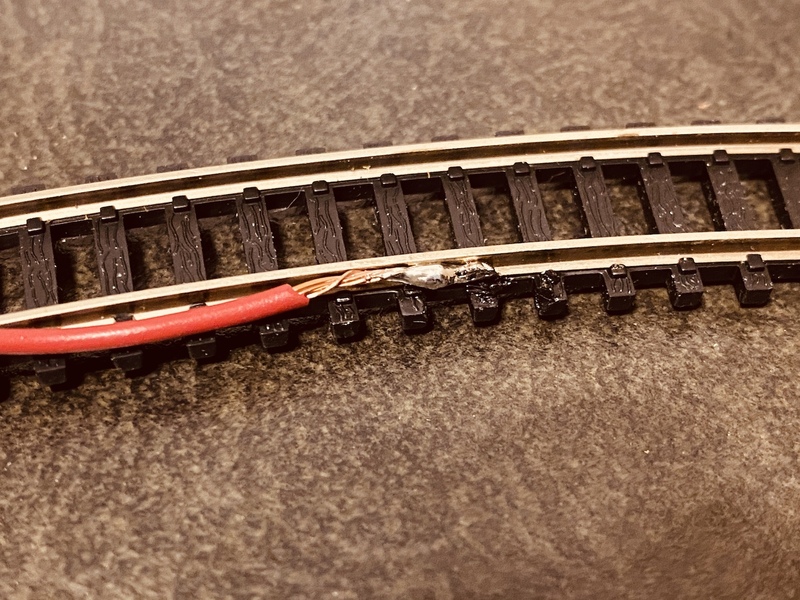 Feeder wires should be added about every 3 feet to assure that all sections of your track get an adequate amount of amperage to run your trains smoothly. The feeder wire should come up through a drilled hole from the bottom of the layout to the outside rail between the ties. Remove about a half a cm of insulation from the wire and bend it with pliers so that the wire can lay flat on outside of the rail. I like to use a surgical clamp (hemostat), which you can get at hobby stores, to hold the wire in place while I solder it. Then apply the liquid flux. Heat up the soldering iron and apply the tip to both the wire and the rail at the same time to heat them both for several seconds. Then apply the solder. When it liquefies and flows into the space between the wire and rail then you can take away the tip, allow it to cool, and then remove the clamp. Twist the 2 ends of the wires together well enough that they have good electrical contact and won’t come apart during the soldering. Then apply the flux. Apply the hot soldering iron to the wires till the flux begins to boil, then apply the solder. After the solder flows over the whole joint, then take away the iron and allow it to cool. Test the strength by trying to pull the wires apart gently. 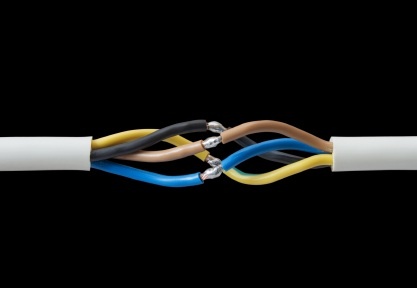 Then apply electrical tape, liquid electrical “tape”, or shrink tubing around the wire joint for insulation. Don’t skip this step or you will likely have short circuits later. From "Soldering Tips" to "Model Railroad Track"
From "Soldering Tips" to "Model Railroad Wiring"